The Army of the Republic of Vietnam (ARVN; Vietnamese: Lục quân Việt Nam Cộng hòa), also known as the South Vietnamese Army (SVA), were the ground forces of the Republic of Vietnam Military Forces, the armed forces of South Vietnam, which existed from 1955 until the Fall of Saigon in 1975. It is estimated to have suffered 1,394,000 casualties (killed and wounded) during the Vietnam War. The TDND 5 airborne unit fought several battles including Dien Bien Phu. Benefiting from French assistance, the VNA quickly became a modern army modelled after the Expeditionary Corps. It included infantry, artillery, signals, armored cavalry, airborne, airforce, navy and a national military academy. 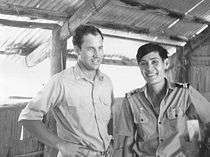 By 1953 troopers as well as officers were all Vietnamese, the latter having been trained in Ecoles des Cadres such as Da Lat, including Chief of Staff General Nguyễn Văn Hinh who was a French Union airforce veteran. After the 1954 Geneva agreements, French Indochina ceased to exist and by 1956 all French Union troops had withdrawn from Vietnam, Laos, and Cambodia. In 1955, by the order of Prime Minister Diệm, the VNA crushed the armed forces of the Bình Xuyên. On October 26, 1955, the military was reorganized by the administration of President Ngô Đình Diệm who then formally established the Army of the Republic of Vietnam (ARVN) on December 30, 1955. The air force was known as the Vietnamese Air Force (VNAF). Early on, the focus of the army was the guerrilla fighters of the Vietnam National Liberation Front (NLF, also known as the Viet Cong (VC)), formed to oppose the Diệm administration. The United States, under President John F. Kennedy sent advisors and a great deal of financial support to aid the ARVN in combating the insurgents. A major campaign, developed by Ngô Đình Nhu and later resurrected under another name was the "Strategic Hamlet Program" which was regarded as unsuccessful by Western media because it was "inhumane" to move villagers from the countryside to fortified villages. ARVN leaders and President Diệm were criticized by the foreign press when the troops were used to crush armed anti-government religious groups like the Cao Đài and Hòa Hảo as well as to raid Buddhist temples, which according to Diệm, were harboring NLF guerrillas. The most notorious of these attacks occurred on the night of August 21, 1963, during the Xá Lợi Pagoda raids conducted by the Special Forces, which caused a death toll estimated to range into the hundreds. In 1963 Ngô Đình Diệm was killed in a coup d'état carried out by ARVN officers and encouraged by American officials such as Henry Cabot Lodge, Jr. In the confusion that followed, General Dương Văn Minh took control, but he was only the first in a succession of ARVN generals to assume the presidency of South Vietnam. During these years, the United States began taking more control of the war against the NLF and the role of the ARVN became less and less significant. They were also plagued by continuing problems of severe corruption amongst the officer corps. Although the US was highly critical of the ARVN, it continued to be entirely US-armed and funded. Although the American news media has often portrayed the Vietnam War as a primarily American and North Vietnamese conflict, the ARVN carried the brunt of the fight before and after large-scale American involvement, and participated in many major operations with American troops. 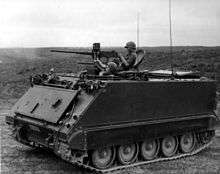 ARVN troops pioneered the use of the M113 armored personnel carrier as an infantry fighting vehicle by fighting mounted rather than as a "battle taxi" as originally designed, and the armored cavalry (ACAV) modifications were adopted based on ARVN experience. One notable ARVN unit equipped with M113 armored personnel carriers (APCs), the 3d Armored Cavalry Squadron, used the new tactic so proficiently and with such extraordinary heroism against hostile forces that they earned the United States Presidential Unit Citation. The Army of the Republic of Vietnam suffered 254,256 recorded deaths between 1960 and 1974, with the highest number of recorded deaths being in 1972, with 39,587 combat deaths, while approximately 58,000 U.S. troops died during the war. There were also many circumstances in which Vietnamese families had members on both sides of the conflict. South Vietnamese Army Operations, 1965. South Vietnamese Army with suspected NLF member, 1965. South Vietnamese Army Operations, 1965. A Douglas A-1 Skyraider, A1E, drops napalm on a target spotted by an O-1 Bird Dog. WAFC (Women's Armed Forces Corps) division in the National Armed Forces Day parade, Saigon, June 19, 1971. Starting in 1969 President Richard Nixon started the process of "Vietnamization", pulling out American forces and rendering the ARVN capable of fighting an effective war against the People's Army of Vietnam (PAVN) of the North (Also called NVA for North Vietnamese Army) and the ally, the National Liberation Front (NLF or Viet Cong). Slowly, ARVN began to expand from its counter-insurgency role to become the primary ground defense against the NLF and PAVN. From 1969 to 1971 there were about 22,000 ARVN combat deaths per year. Starting in 1968, South Vietnam began calling up every available man for service in the ARVN, reaching a strength of one million soldiers by 1972. In 1970 they performed well in the Cambodian Incursion and were executing three times as many operations as they had during the American war period. However, the ARVN equipment continued to be of lower standards than their American and South Korean allies, even as the U.S. tried to upgrade ARVN technology. However, the officer corps was still the biggest problem. Leaders were too often poorly trained, corrupt, lacking morale and inept. However, forced to carry the burden left by the Americans, the South Vietnamese Army actually started to perform rather well, though with continued American air support. In 1972, General Võ Nguyên Giáp launched the "Easter Offensive", an all-out attack against South Vietnam from the DMZ. The assault combined infantry wave assaults, artillery and the first massive use of armored forces by the PAVN. Although T-54 tanks proved vulnerable to LAW rockets, the ARVN took heavy losses. The PAVN and NLF forces took Quảng Trị Province and some areas along the Laos and Cambodian borders. President Richard Nixon dispatched more bombers in Operation Linebacker to provide air support for the ARVN when it seemed that South Vietnam was about to be lost. In desperation, President Nguyễn Văn Thiệu fired the incompetent General Hoàng Xuân Lãm and replaced him with General Ngô Quang Trưởng. He gave the order that all deserters would be executed and pulled enough forces together in order to prevent the PAVN to take Huế. Finally, with considerable U.S. air and naval support, as well as hard fighting by the ARVN soldiers, the Easter Offensive was halted. ARVN forces counter-attacked and succeeded in driving part of the PAVN out of South Vietnam, though they did retain control of northern Quảng Trị province near the DMZ. At the end of 1972, Operation Linebacker II helped achieve a negotiated end to the war between the U.S. and the Hanoi government. By 1974, the United States had completely pulled its troops out of Vietnam. The ARVN was left to fight alone, but with all the weapons and technologies that their allies left behind. With massive technological support they had roughly four times as many heavy weapons as their enemies. The U.S. left the ARVN with thousands of aircraft, although the B-52 strategic bombers were removed to the United States, making the South Vietnam Airforce the fourth largest air force in the world. These figures are deceptive, however, as the U.S. began to curtail military aid. The same situation happened to the Democratic Republic of Vietnam, since their allies, the Soviet Union, and China has also cut down military support, forcing them to use obsolete T-34 tanks and SU-100 tank destroyers in battle. In the summer of 1974, Nixon resigned under the pressure of the Watergate scandal and was succeeded by Gerald Ford. With the war growing incredibly unpopular at home, combined with a severe economic recession and mounting budget deficits, Congress cut funding to South Vietnam for the upcoming fiscal year from 1 billion to 700 million dollars. Historians have attributed the fall of Saigon in 1975 to the cessation of American aid along with the growing disenchantment of the South Vietnamese people and the rampant corruption and incompetence of South Vietnam political leaders and ARVN general staff. Without the necessary funds and facing a collapse in South Vietnamese troop and civilian morale, it was becoming increasingly difficult for the ARVN to achieve a victory against the NLF. Moreover, the withdrawal of U.S. aid encouraged North Vietnam to begin a new military offensive against South Vietnam. This resolve was strengthened when the new American administration did not think itself bound to this promise Nixon made to Thieu of a "severe retaliation" if Hanoi broke the 1973 Paris Peace Accords. The fall of Huế to NLF forces on March 26 began an organized rout of the ARVN that culminated in the complete disintegration of the South Vietnamese government. Withdrawing ARVN forces found the roads choked with refugees making troop movement almost impossible. North Vietnamese forces took advantage of the growing instability, and with the abandoned equipment of the routing ARVN, they mounted heavy attacks on all fronts. With collapse all but inevitable, many ARVN generals abandoned their troops to fend for themselves and ARVN soldiers deserted en masse. President Nguyễn Văn Thiệu escaped with large amounts of money and the assistance of the CIA, according to a reporter. Except for one battle by the 18th Division at Xuân Lộc and the perimeters around Saigon, ARVN resistance all but ceased. Less than a month after Huế, Saigon fell and South Vietnam ceased to exist as a political entity. The sudden and complete destruction of the ARVN shocked the world. Even their opponents were surprised at how quickly South Vietnam collapsed. The U.S. had provided the ARVN with 793,994 M1 carbines, 220,300 M1 Garands and 520 M1C/M1D rifles, 640,000 M-16 rifles, 34,000 M79 grenade launchers, 40,000 radios, 20,000 quarter-ton trucks, 214 M41 Walker Bulldog light tanks, 77 M577 Command tracks (command version of the M113 APC), 930 M113 (APC/ACAVs), 120 V-100s (wheeled armored cars), and 190 M48 tanks; however on the eleventh hour, an American effort in November 1972 managed to transfer 59 more M48A3 Patton tanks, 100 additional M-113A1 ACAVs (Armored Cavalry Assault Vehicles), and over 500 extra aircraft to South Vietnam. Despite such impressive figures, the Vietnamese were not as well equipped as the American GI's they replaced. The 1972 offensive had been driven back only with a massive American bombing campaign against North Vietnam. The VNAF had 200 A1, A-37 Ground Attack Aircraft and F-5 fighters, 30 AC-47 gunships and 600 transport, training and reconnaissance aircraft, and 500 helicopters. But their lightweight attack fighters lacked the punch of offensive bombers and fighters such as the B-52 and F-4 Phantom. Many aircraft were shot down by Soviet-supplied NVA surface-to-air missiles and anti-air batteries. The Case–Church Amendment had effectively nullified the Paris Peace Accords, and as a result the United States had cut aid to South Vietnam drastically in 1974, just months before the final enemy offensive, allowing North Vietnam to invade South Vietnam without fear of U.S. military action. As a result, only a little fuel and ammunition were being sent to South Vietnam. South Vietnamese air and ground vehicles were immobilized by lack of spare parts. Troops went into battle without batteries for their radios, and their medics lacked basic supplies. 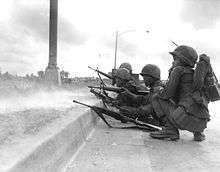 South Vietnamese rifles and artillery pieces were rationed to three rounds of ammunition per day in the last months of the war. Without enough supplies and ammunition, ARVN forces were quickly thrown into chaos and taken down by the well-supplied PAVN, no longer having to worry about U.S. bombing. The years after the war were not kind to some ARVN soldiers. Many were sent for years to special "reeducation camps", which consisted of forced labor and political indoctrination. The Americans and South Vietnamese had laid large minefields during the war, and former ARVN soldiers were made to clear them. Thousands died from sickness and starvation and were buried in unmarked graves. The South Vietnamese military cemetery at Biên Hòa was vandalized and abandoned, and a mass grave of ARVN soldiers was made nearby. The charity "The Returning Casualty" in the early 2000s attempted to excavate and identify remains from some camp graves and restore the cemetery. Reporter Morley Safer who returned in 1989 and saw the poverty of a former soldier described the ARVN as "that wretched army that was damned by the victors, abandoned by its allies, and royally and continuously screwed by its commanders". 1st Infantry Division – The French formed the 21st Mobile Group in 1953, renamed 21st Division in January 1955, the 1st Division later that year. Considered "one of the best South Vietnamese combat units". Based in Huế, it had four rather than three regiments. 2nd Infantry Division – The French formed the 32nd Mobile Group in 1953, renamed 32nd Division in January 1955, then the 2nd Division later that year. Based in Quảng Ngãi, it was considered a "fairly good" division. 3rd Infantry Division – Raised in October 1971 in Quảng Trị. One regiment was from the 1st Division (the 2nd Inf Regt). Composed of 2nd Inf Regt, 56th Inf Regt, and 57th Inf Regt. Based at Da Nang. It collapsed in the 1972 Easter Offensive, was reconstituted, and was destroyed at Da Nang in 1975. 5th Infantry Division – Originally formed in North Vietnam as the 6th Division (commonly known as the "Nung" division), and renamed the 3rd Field Division after its move to Song Mao then to the 5th Division in 1959. Many Nungs originally were in its ranks. It was at Biên Hòa in 1963 and was involved in the overthrow of Diệm. It then operated north of Saigon. It entered Cambodia in 1970 and defended An Lộc in 1972. 7th Infantry Division – Formed as the 7th Mobile Group by the French, it became the 7th Division in 1959. Served in Mekong Delta 1961–75. 9th Infantry Division – Formed in 1962, northern Mekong Delta. 18th Infantry Division – Formed as the 10th Division in 1965. Renamed the 18th Division in 1967 (number ten meant the worst in GI slang). Based at Xuân Lộc. Made famous for its defence of that town for a month in March–April 1975. 21st Infantry Division – The ARVN 1st and 3rd Light Divisions were formed in 1955, then renamed the 11th and 13th Light Divisions in 1956. They were combined to form the 21st Division in 1959. Served mainly near Saigon and in the Mekong Delta. 22nd Infantry Division – Initially raised as the 4th Infantry Division, which existed briefly in the 1950s, but was renamed the 22nd Division as four is considered an unlucky number in Vietnam (soundly like the word for death). The ARVN 2nd and 4th Light Divisions were formed in 1955; the 4th was renamed the 14th Light Division in 1956. They were combined to form the 22nd Division in 1959. It served near Kon Tum and elsewhere in the Central Highlands. It collapsed in 1972, and in 1975 was in Bình Định province. It was evacuated south of Saigon as Central Highlands front fell, and was one of the last ARVN units to surrender. 23rd Infantry Division – Originally the 5th Light Division, it was renamed 23rd in 1959. It operated in central Vietnam, and entered Cambodia in 1970. It fought well in 1972, successfully defending Kon Tum, but was shattered in 1975 while defending Ban Me Thout. 25th Infantry Division – Formed in Quảng Ngãi in 1962, it moved to south west of Saigon in 1964. It entered Parrot's Break, Cambodia in 1970, and defended the western approaches of Saigon in 1972 and 1975. Airborne Division – A branch of the VNAF, which was formed by the French as the Airborne Group in 1955. Brigade strength by 1959, it was formed as division in 1965. Based at Tan Son Nhut airbase, it was used as a fire brigade throughout SVN. It included 9 Airborne Battalions and 3 Airborne Ranger Battalions. It fought in Cambodia in 1970 and Laos in 1971. 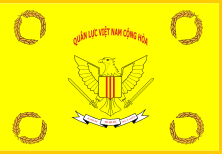 It was used as brigade Groups in 1975, the 1st at Xuân Lộc, the 2nd at Phan Rang, and the 3rd at Nha Trang. Republic of Vietnam Marine Division - A branch of ARVN which was formed in 1954 and had a generally good reputation as a combat force. ARVN Rangers fighting in Saigon during the Tet Offensive, 1968. Đỗ Cao Trí, Commander of ARVN's III Corps during 1968–71, known for his fighting prowess, but also his flamboyant lifestyle and allegations to corruption. Nguyễn Ngọc Loan, Chief of the Republic of Vietnam National Police who fought in Saigon during the 1968 Tet Offensive. Involved in the famous "Saigon Execution". ↑ Vietnamese National Army gallery (May 1951 – June 1954) French Defense Ministry archives ECPAD Archived March 26, 2009, at the Wayback Machine. Pierre Darcourt (1977). Bay Vien, le maitre de Cholon [Bay Vien, Cholon's Master] (in French). Hachette. ISBN 978-2-01-003449-7. Alfred W. McCoy (2003). The Politics of Heroin. Lawrence Hill Books. ISBN 1-55652-483-8. ↑ "Photo: U.S. advisor confers with ARVN 3rd Cav commander in front of a South Vietnamese M113". Archived from the original on 14 June 2010. Retrieved 2010-06-11. ↑ "3d Armored Cavalry Squadron (ARVN) earned Presidential Unit Citation (United States) for extraordinary heroism" (PDF). Retrieved 2010-06-11. ↑ Walter, John (2006). Rifles of the World (3rd ed.). Iola, WI: Krause Publications. p. 147. ISBN 0-89689-241-7. "A Brief Overview of the Vietnam National Army and the Republic of Vietnam Armed Forces (1952–1975)" (PDF). Retrieved October 10, 2009. Moyar, Mark (October 2006). Triumph Forsaken: The Vietnam War, 1954–1965. Cambridge University Press. ISBN 0-521-86911-0. Simpson, Howard R. (August 1992). Tiger in the Barbed Wire: An American in Vietnam, 1952–1991. Brassey's Inc. ISBN 0-7881-5148-7. Tucker, Spencer C. (2000). Encyclopedia of the Vietnam War. Santa Barbara, California: ABC-CLIO. pp. 526–533. ISBN 978-0-87436-983-0. Collins, Jr., Brigadier General James Lawton (1991) . The Development and Training of the South Vietnamese Army, 1950–1972. Vietnam Studies. United States Army Center of Military History. CMH Pub 90-10. 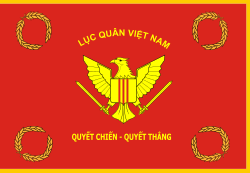 Wikimedia Commons has media related to Army of the Republic of Vietnam.